You simply won’t believe your eyes when you see Eddie Redmayne’s performance as theoretical physicist Stephen Hawking. It’s an amazing, transformative performance that elevates the film above the typical bio-pic Oscar bait that we usually see this time of year. “The Theory of Everything” isn’t a documentary. If you want to learn about the theories and science from the mind of Mr. Hawking look elsewhere. The film deals with the relationship with his wife Jane (Felicity Jones) and the onset of his motor neuron disease that robbed him of his ability to move and speak but not his ability to be a brilliant scientist. The film is a sort of hybrid of “A Beautiful Mind” and “The Diving Bell and theButterfly” without the former film’s plot twists and the latter film’s artistic merit. The film is simply told, written, and shot, but it’s the film’s performances that truly make the film work. 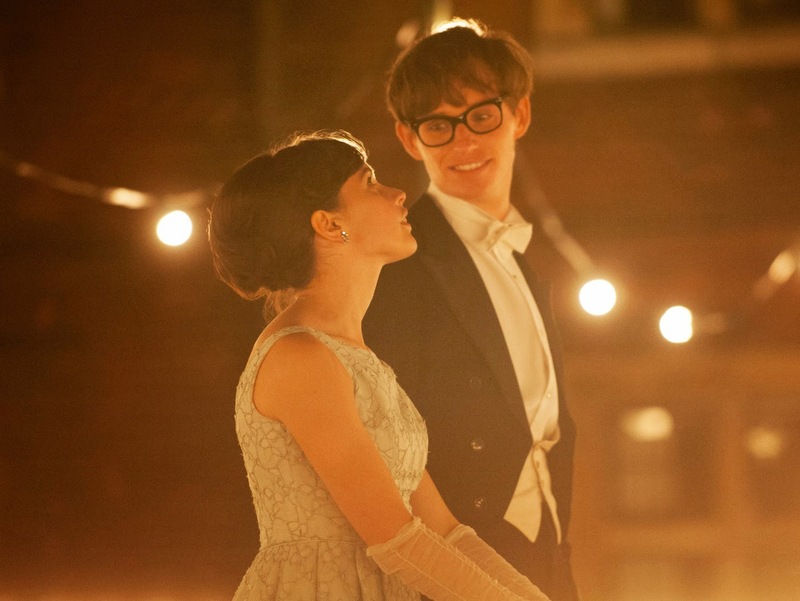 The film starts as a college-aged Stephen Hawking begins wooing a young college-aged Jane Wilde while attending the University of Cambridge in 1960s England. As their relationship begins to take off Stephen begins noticing strange things about his body that results in a terrible prognosis: he’s given two years to live. He’s diagnosed with a neurological disorder similar to that of Lou Gehrig’s disease. He quickly insists on shutting everyone out including his college friends and Jane. But Jane is defiant and declares her love for Stephen and so begins their rocky relationship including marriage and children, which we get to see in short bursts depicted in nifty 8mm home movie montages. As time passes Stephen’s condition worsens, first to the point where he can’t walk and then after having a tracheotomy, no longer being able to speak. There’s no real focus on Hawking’s scientific theories, but how many of us would actually understand much of it anyways? And unless they were to add some “A Beautiful Mind” storyline trickery, I believe the film’s current straightforward narrative was the wise choice. The film’s script by Anthony McCarten is more interested in the relationship than Stephen’s scientific theories as it should be – the film is based on Jane Wilde Hawking’s book about her life with Stephen. Director James Marsh (“Man on Wire”), denies the film any real sort of standout visual energy but rather focuses on the performances of his actors. Redmayne is a revelation giving such an astounding physical performance that’s equally as good as anything Daniel Day-Lewis did in “My Left Foot.” He knows how to rein it in however, refusing to ever overact. He gets the job done flawlessly. Jones’ work is much more subtle though it makes sense – she’s in the supportive wife role and therefore has a less meaty role. She does get more to do when the film introduces church organist Jonathan (Charlie Cox) who Jane begins to have feelings for. Composer Jóhann Jóhannsson’s piano-centric score is also a standout. Trailer for The Theory of Everything on TrailerAddict.